I love them, they are my favourite doll! They are also my favorite that you draw. But you draw wonderful dolls, and I’m sure whatever you post will be great. Plus its no fun drawing for a doll that doesnt impress you. 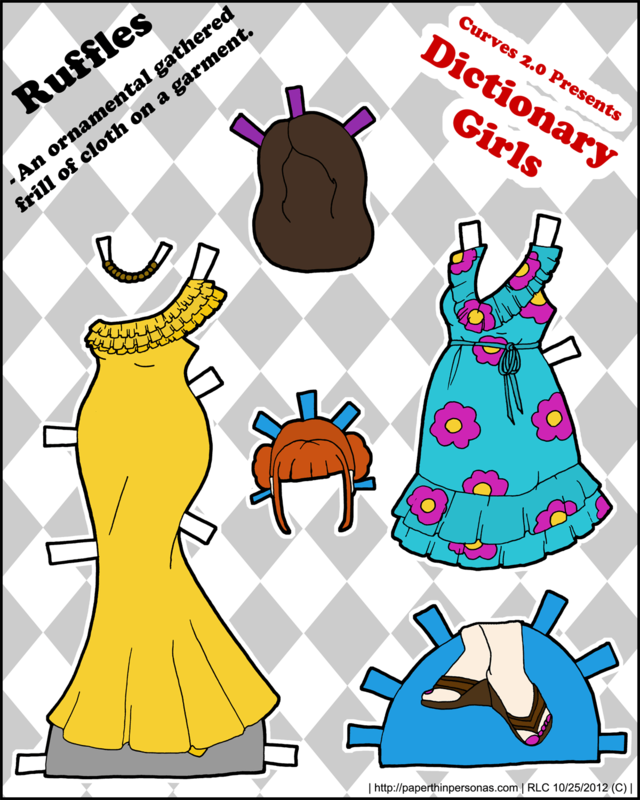 I agree about the more cartoonish but still awesomely curvy paper doll. I would love to see that as I have always enjoyed Marisole a little more than the Curves series (despite having a special place as a curvy woman for the curvy paper doll). So, after reading some of these lovely comments (and thank you everyone who takes the time to comment), I realize that the post was probably a little more dramatic than I intended it to be. Ana & K, I’m glad to hear that some peoples love the Dictionary Girl’s the best. I tend to assume Marisole is everyone’s favorite since the statistics bare that out, but I forget there’s a side to the site that statistics don’t tell. Laura & Erin, I certainly think a Curvy paper doll belongs on the site. I just need to decide how to make it work. It might be that the “trick” is to just re-draw the Dictionary Girl’s faces or it might be that I use the same pose and draw a different doll who can share clothing or it might be that I say “screw it” and do something new. I may also decide to open up the Dictionary Girl’s to more options as far as clothing styles… I haven’t decided yet. But I do love to hear from readers. I must admit, Dictionary Girls haven’t been my favorite either. I don’t hate them, I’m just not nuts about them. Here’s a different idea for you, if you feel so inclined. I once saw pictures of Disney Princesses that were cartooney, yet curvy and sassy. I can’t seem to find the ones I’m thinking of, but I did try Googling “Disney Princess Pinups” and came up with some that were pretty close. To clarify, I didn’t mean doing Disney, I just meant something along those lines of cartooney, sassy, and curvy. The dictionary girls are my favorite, I like that they’re curvy and I really like their faces. I’d like them to continue, but if you don’t want to draw them anymore I think it might show through.